As more and more people embrace cloud storage, USB flash drives are becoming less essential. This is unfortunate, as it can be empowering to store your own data locally -- not needing an internet connection to access things like family photos and movies. Today, Kingston announces a product that may get people excited about flash drives again. The company has created a 2TB pocket flash drive (also available in 1TB), called DataTraveler Ultimate GT (Generation Terabyte). This is now the world's largest capacity USB flash drive. "Power users will have the ability to store massive amounts of data in a small form factor, including up to 70 hours of 4K video on a single 2TB drive. DataTraveler Ultimate GT offers superior quality in a high-end design as it is made of a zinc-alloy metal casing for shock resistance. Its compact size gives the tech enthusiast or professional user an easily portable solution to store and transfer their high capacity files," says Kingston. Jean Wong, Flash business manager explains, "At Kingston, we push the limits of what's possible. With the DataTraveler Ultimate GT, we empower users to increase their data storage mobility in a highly manageable form factor. This is a terrific follow up to our 1TB drive released in 2013 and by doubling the capacity, users can store and carry even larger amounts of data easily". The company shares the following specifications. Kingston does not quote any specific speeds, so we will need to wait for benchmarks from reviewers in the future. Unfortunately, the drive uses USB Type-A, and not the newer Type-C connector. This is fine for most computer users, but owners of newer machines, such as the 2016 MacBook Pro, cannot use this without a dongle (d'oh!). Also, it will not be radically fast, as it uses USB 3.0 and not the faster USB 3.1 generation 2. 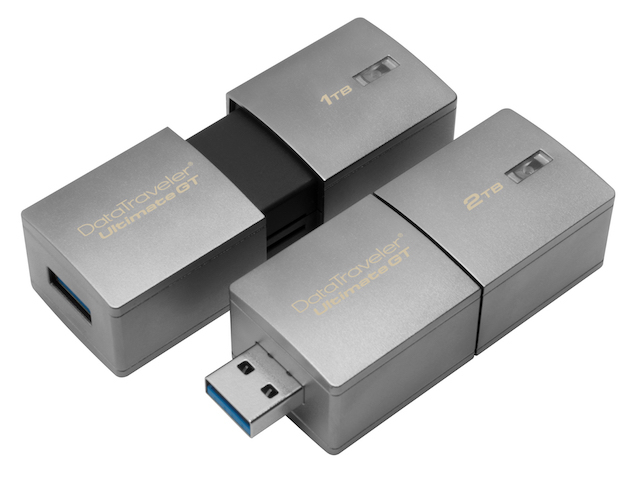 Kingston will be selling the DataTraveler Ultimate GT in both capacities starting next month. Pricing is unknown for now, but do not expect it to be affordable -- a 2TB flash drive should prove to be quite expensive.